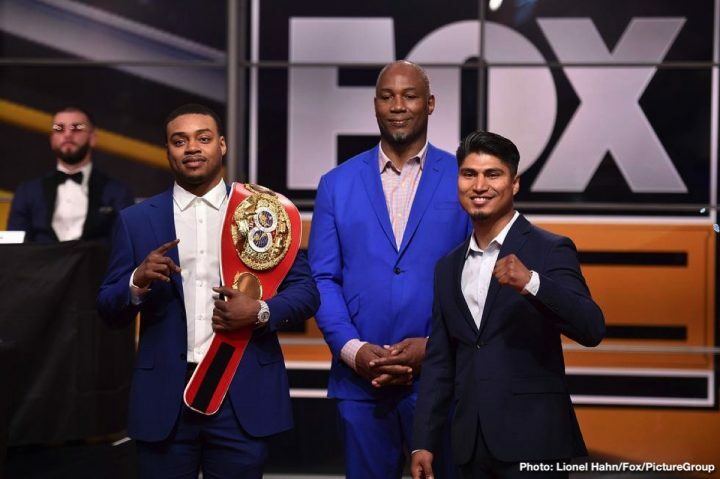 By Dan Ambrose: Trainer Robert Garcia was asked this week whether he’ll throw in the towel if his fighter Mikey Garcia starts getting worked over by Errol Spence Jr. in their fight on March 16 at AT&T Stadium in Arlington, Texas. Robert says he will step in to stop the fight if it gets out of hand, just as he would for any of his fighters. Mikey (39-0, 30 KOs) is a considerable underdog against the unbeaten Spence (24-0, 21 KOs) in the eyes of a lot of boxing fans. The fight is considered a crazy one for Mikey to be taking, as he zero experience at welterweight, and he looked poor and vulnerable when he fought former IBF light welterweight champion Sergey Lipinets last March. Mikey beat Lipinets, but he took a ton of punishment from him. After the fight, Mikey looked like the loser with his bloody, swollen face. The much smaller Garcia, 31, is moving up two weight classes to challenge International Boxing Federation welterweight champion Spence for his belt. This is a fight that many of the fans are not even considering Garcia as having a chance of pulling off an upset. The main thing the fans are talking about is whether Mikey can go the full 12 rounds in taking vicious punishment. However, Robert Garcia might stop the fight if it looks like his brother Mikey doesn’t stand a chance and is just soaking up punishment. Spence vs. Garcia will be televised on FOX Sports pay-per-view on Saturday, March 16. The televised portion of the Spence-Garcia fight card begins at 9:00 p.m. ET / 6:00 p.m. PT. “We’re not even thinking about that but I am an experienced boxing trainer and I’ve done it before,” Robert G. said to Fighthub about him potentially stepping in to halt the fight on March 16 if it looks like Mikey is taking a shellacking at the hands of the 28-year-old Spence. “I think with any of my fighters, not just Mikey, because he’s my brother, but any of my fighters, if I see that one of my fighters is getting hurt and there’s no chance of him winning the fight, of course I’m going to stop my fighter,” Robert G. said. We’ve already seen Robert G. step in to save Mikey in his fight against Orlando Salido in January 2018. Mikey was doing well in the first five rounds against Salido in dropping him four times, but the fight changed hands by the 7th. Mikey was taking punishment all of a sudden, looking tired, and no longer dominating like he had been. Robert then stepped in and had the fight halted after Mikey suffered a broken nose in the 8th from a clash of heads. Robert told the referee that Mikey’s broken nose was too much of a problem for the fight to be allowed to continue. However, Salido pointed out that he had a broken nose as well, and he didn’t quit. The fight went to the scorecards, and Mikey won an 8th round technical decision by the scores 79-69, 79-69 and 79-70. The way that the Robert G. stepped in to stop the fight when his brother Mikey started to get the worst of it from Salido, it looked to some like he was bailing him out. If we see the same scenario on March 16, it’s possible that Mikey will push hard in the first six rounds to build up any kind of lead, and then once the fight goes into the second half of the bout, we could see Robert pull him out with an injury of some sorts, perhaps even a cut or busted nose. The fight would then go to the scorecards like the Mikey-Salido fight did, and we could potentially see an ugly technical decision like in that fight. A lot of boxing fans would be upset, just as they were with Robert stopping the Mikey vs. Salido fight when his brother was starting to get beaten up, but there wouldn’t be anything they could do about it. “I’ve done it before. It’s nothing new and any experienced trainer should do stuff like that for his fighter,” Robert said about how he’s stopped fights before when his fighters have been getting worked over. Of course, Robert stopped fights before when his fighters have started getting the worst of it. We saw that in Mikey’s fight with Salido. All of a sudden, Robert pulled Mikey out when he got tired, and was getting worked over by Salido. Yeah, Mikey had a nose injury, but so did Salido, and he wanted to keep fighting. Salido wasn’t happy with the way the referee allowed Mikey to get away with shoving him the entire fight. Mikey was holding his left arm way out in front of him, and using it to push off to keep Salido from getting near him to land shots. That’s not legal in boxing, but the referee stood and watched without the addressing it. Salido was unhappy with the way Mikey kept pushing him the entire fight to keep him from getting close enough to land. However, by the 7th, Salido was able to work his way past Mikey’s outstretched left hand to land body shots. That’s when Mikey started gassing and looking bad. Robert had to have known that Mikey was fading fast. The stoppage at the end of the 8th round clearly saved Mikey from what would have been a torturous final four rounds of the fight. With the way the prime Salido was coming on, a stoppage of Mikey was not out of the question. Robert choosing to stop the fight due to Mikey’s broken nose kept Salido from being able to fully wear him down and stop him. The question is will Robert throw in the towel to save his brother Mikey or will he let it go on, hoping that he can rally against Spence. Some of Robert’s fighters were allowed to take punishment without him stopping the fight. Brandon Rios and Antonio Margarito punishment without Robert stopping the fight. With Mikey being his brother, will Robert G let him take punishment from Spence or will he throw the towel in as soon as he starts getting worked over. Having seen the Garcia vs. Salido fight, it’s hard to imagine there being a plan for Mikey to build up a small lead in the first six rounds before he bows out with an injury by the 7th. Hopefully that’s not going to be the case, but we’ve seen it before. Robert G says he would have preferred to see Mikey get experience at welterweight before he faced Spence. Whether experience would help Mikey or not is the big question. It would depend on the level of opposition that Mikey was put in with. If he was fed a fringe contender from the bottom of the top 15 like Mikael Zewski, Samuel Vargas, Conor Benn, Rico Muller or Frank Rojas, then it wouldn’t help Mikey one bit get ready for Spence at 147. The only way Mikey would be helped is if he fought someone good like Danny Garcia, Egidijus Kavaliauskas, Josh Kelly or Daniyar Yeleussinov. Those guys would give Mikey a run for his money, and maybe even beat him. Yeleussinov would be a nightmare for Mikey to fight, but if he beat him, he would definitely be ready to fight Spence. I’m not saying Mikey would beat Spence, but he would at least have some practical experience at 147 that he could lean on for the fight. The way things are now, Mikey is going into the fight with Spence following a win over the bone-thin Robert Easter Jr and an grueling fight against Sergey Lipinets. Neither of those fights were the type of contests that will get Mikey ready for what’s in store for him when he gets inside the ring with Spence.